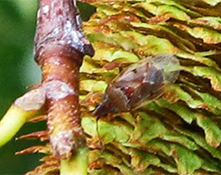 The birch catkin bug affects Birch trees. Catkin bugs occur on birch, especially in trees, on lawns and in parks. They feed on the catkins and kill the seed, but do not cause damage to the growth or appearance of the tree. They may occur on other species of trees and shrubs, but in Ontario, they are found mostly on birches. These bugs produce a stench when crushed. The odour can be detected when mowing the lawn where large numbers of infested catkins have fallen on the grass. 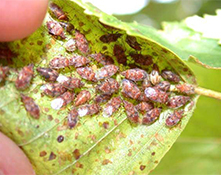 Catkin bugs could cause some inconveniences when infested trees are near patios, swimming pools, and houses. The birch catkin bug spends the winter in the old catkins, under fallen leaves and in other protected places. The bugs become active in early spring, mate and lay eggs in May and June. The nymphs, similar in shape to the adults, develop in the catkins. In Ontario, there appears to be only one generation a year. The birch catkin bug is about 4-5mm (1/4 inch) long. The adult is reddish-brown with clear wing tips extending beyond the abdomen. It belongs to the same family as the hairy chinch bug. In general, no control is necessary or recommended. The use of weather stripping around doors and windows, along with repairing and caulking all cracks in house foundations, will prevent the bugs from moving indoors. Use a vacuum cleaner to remove the insects that wander indoors. An aerosol spray containing pyrethrin can be used as a spot treatment indoors. 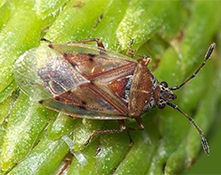 Although it is the most commonly encountered species, the birch catkin bug is not the only insect feeding on birch catkins. The control of these other birch catkin pests is similar to the one suggested in this fact sheet.